I recently read the book Last Minute Patchwork and Quilted Gifts by Joelle Hoverson and I have a list of new items that I want to complete. I love how the book is broken down into how many hours the project takes to complete. 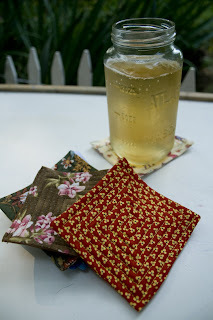 Tonight I finished a much needed set of coasters for our house and also made a set to give as a hostess gift. The book has a wonderful suggestion : "Wrap a set of coasters together with a recipe and supplies for iced tea for a special summer house-warming gift".